Colored stripes ranging from green (really really LOW caffeine level) to RED for "danger zone". Coffee, tea and chocolate make life worth living! * Sugar & Spice: It's everything nice! Enjoy the flavors of the holidays with sweet sugar and cinnamon spice. * Gingerbread Latte: The sweet spiciness of gingerbread paired with the delicious flavor of a coffeehouse latte. * Eggnog Latte: Nothing says "holiday" like the taste of eggnog. Usually, decaf is a waste - but if you desperately need the taste of coffee late in the evening then I totally understand the need for decaf. But absolutely not first thing in the morning! I will mix a little decaf in with reg. coffee. Not for the purists, maybe, but it fills the cup and decreases the buzz a bit. Tea doesn't have as much caffeine as coffee does, but if you're watching your blood pressure, I would suggest drinking Decaf Tea just to be on the safe side. Coffee and early mornings - nothing can beat that. "No one would ever drink decaf if they saw or knew how they dec it "..
Agree, as the saying goes..you love the hotdog but not how it is made. Essays completing doesn't attract you? The research writing services will be the best place to order comparison essay at. EWE! for a min I thought u were going to tell me you were diabetic..was that the catch ? Scared me! Mixing decaf and regular is a solution that works for me after I've had a few cups. The problem with the coffee I like is that it has so much caffine, I just can't drink as much as I like. I read the post made by Robin Ells about JavaFit and what she didn't mention was the fact that this coffee taste great...It took the Javulation Coffee Company 2 years to get this coffee so that you couldn't taste the vitamins and minerals. It's a patented formula and their were clinical trials run to prove that it does what they say it does. I drink the Energy Extreme and the Diet Plus and I'm loosing weight...Yippie. I urge all coffee drinkers to take her up on her offer to send you a sample. I know you're all going to love it as much as I do. JavaFit Vitamin Fortified Functional Coffee, made with Arabica Beans! Taste Great...Contact me for a FREE sample! Over 110 million Americans regularly drink at least one cup of “non functional” coffee every day. Now, for the first time, they can also be receiving nutritional value at the same time. Most regular coffee drinkers forget to take their vitamins or, don’t take them at all but a coffee drinker NEVER forgets to drink their coffee. The Javalution Coffee Company has come up with a patented way to ensure that these coffee drinkers receive their nutritional supplements every day, 365 days per year. The company has been in business since 2002 in Florida and has marketed their product successfully through traditional retail methods. While they have been successful, they have not been able to expand significantly outside the State of Florida. What they found when marketing retail is that people wanted to taste the coffee before they bought it…much like you. The company brought in a team of marketing specialist and it was determined that the best way to market the coffee was on a direct basis…lucky for you and me. My mom has acid reflux so she can't have caffeine or chocolate, this might work for her. In this house, unfortunately we do have to cut our caffeine consumption, not because of blood pressure, but because of anxiety issues. We still buy and grind good quality beans, so we're not losing taste, just the buzz (which is fine by me - I happen to like the taste of coffee). Since we drink mostly Americano's, here at home we've cut down to 1/4 caffe. When out in the world and we want a cup of coffee, we generally have a split shot. Works for us and we don't feel like we're compromising anything. Wow! I am getting an unusual high just by looking at these pictures...I am definitely hitting the stores and get my choco dose...got to have one! Coffee in moderation is fine. Excess of anything is bad. I found the article at www.jacksoncoffeeco.com to be on point about this. I used these strips and found that they are not as accurate as one thinks. Where are your related posts? Decaf is the way forward however a good balance is the key to a healthy coffee habbit. There are plenty of good decaf brands out there so we have no excuse if we choose to drink decaf only. I don't go cold turkey for caffine like some people so I find I can take it or leave it. Depends on my mood. Check this awesome coffee class out...I am going. on February 23, 2009- February 24, 2009 at 9:00am-5:00pm. It's a pricey class, the cost is $795, but it seems worth it. Check out the site and the description below. In this two-day intensive, created for devoted coffee lovers and industry professionals, students will dissect every detail that goes into crafting a superior brew. Class begins with a fascinating botanical and historical overview of the bean, touching on coffee’s cultural significance through the ages, before embarking on an in-depth study of coffee in two of its elemental forms, espresso and cappuccino. Was just wrapping some coffee mugs, beans and cookies for Lovely Daughter and Son&Heir ("heir" means he gets to care for me in my old[er] age *heh*) and thought of you Christine. Merry Christmas. I've always wondered about caffeinated vs. decaffeinated coffee, but have stuck with the 'hard stuff' most of my life. OR, I go half and half. Those testers you have look like they belong in an 8th grade science lab. What were those for?? 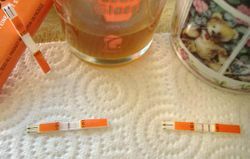 Testing pH levels? Probably very similar technology. I need my caffeine but think this is great for people who simply can't have it for health reasons. I don't know what I'd do without my Kona coffee. 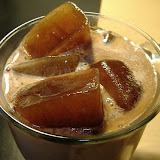 I order it online at https://konaluna.com and make it at home so I don't even have to leave the house for this gourmet treat - bring on the caffeine! If they were going to make something accurate, I'm sure it would be just like those old do-it-yourself chemistry kits. Not so very portable. PS. Did the tall bearded one give you any of that toffee? I rarely drink decaf. Occasionally, if I think I've had too much caffeine on a given day, I will mix a little decaf in with reg. coffee. Not for the purists, maybe, but it fills the cup and decreases the buzz a bit. Decaf is really only if you have to do it (blood pressure etc.). It's a shame and it's not what coffee is about.